My Neighbor Totoro is probably one of Miyazaki's most well-known films. For a lot of fans, this movie was an introduction to Miyazaki's amazing and wonderful world. 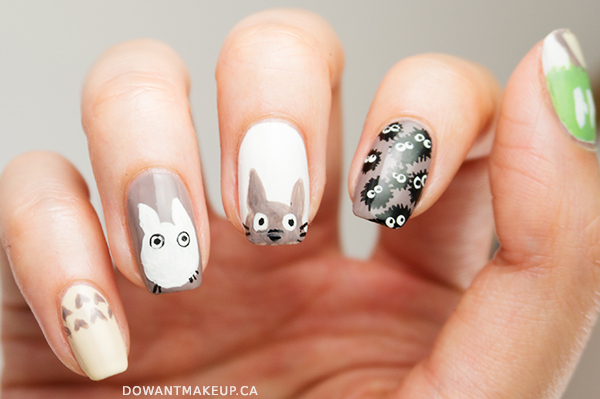 (Princess Mononoke was actually the first Miyazaki movie I watched, but Totoro is way easier to translate into nail art.) His films are so captivating both in a narrative and visual sense, so I decided to pay tribute featuring Totoro (and friends) in today's nail art post. If you haven't seen My Neighor Totoro--you should and preferably in the Japanese audio with English subtitles, because films are always better in their original language--it is a film about two young sisters who move to the countryside to be closer to their ill mother and discover the magical creatures that live in the surrounding forests. It's a really sweet and charming film and a great example of how Miyazaki often juxtaposes ordinary people with extraordinary creatures or settings. Other thing I love: how often do you see a movie with a broad target audience where both main characters are girls and it is not a princess movie? Exactly. Hello hello! I didn't mean to neglect posting for basically 2 weeks, but a breakout of eczema on my face and hands, plus a four-hour final exam to study for really put the blog low on the priority list. 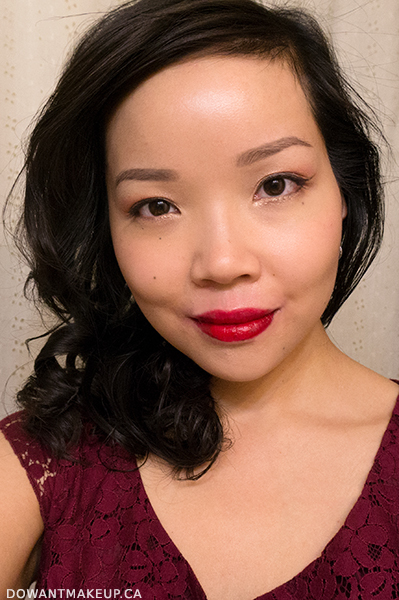 I'm back to share a FOTD and photos from my birthday dinner with bf last month. I rarely do FOTDs anymore because it's such a hassle to edit out the eczema, but I'm so hairstyling-inept that when I curl my hair, it must be documented. I busted out all my favourite fancypants makeup for this look: Dermablend Smooth Indulgence Foundation in Sand Beige, Guerlain Météorites Perles in Teint Beige 02, and Becca Lowlight Sculpting Perfector. Brows are a combination of MAC eyeshadow in Concrete and Anastasia Dipbrow Pomade in Medium Brown. I haven't worn eyeshadow in forever but I used my trusty MAC palette with Gleam and Naked Lunch, plus Clinique Quickliner for Eyes in Intense Clove. Blush is Clinique Cheek Pop in Peach Pop, and the lipstick is Annabelle TwistUp in Red Carpet, a perfect bright red for celebrating.